It’s always about the flowers – beautiful, joyful blooms, captivating aromas, and striking arrangements. Flowers that celebrate, decorate, show you care, or commemorate loved ones. It is this passion that saw Kathy establish her own florist shop in the lovely little community of Clifton Shopping Centre, Port Macquarie, several years ago. A supporter of local growers and suppliers, Kathy’s Creative Flowers now has many loyal customers who value the wide variety of fresh flowers available and the unique arrangements that are Kathy’s forte. 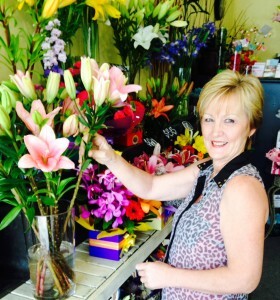 Generous, stunning arrangements, a smiling, friendly, can-do service and a large selection of flowers, hampers and other delightful gifts – this is what Kathy’s Creative Flowers in Port Macquarie is known for. I love Kathy’s flowers because of their freshness – they last for ages. I purchase her posies mostly for elderly people because they are colourful, compact, beautifully arranged and make you smile. The flowers for my mother’s funeral were just gorgeous and her manner and patience at this sad time was unsurpassed. I phone Kathy a couple of times a year to send flowers to my mother in Port Macquarie. She always remembers me and my mother’s favourite flowers. She is great value for money and mum is always delighted! I found Kathy’s Creative Flowers ten years ago and have been using her ever since, mostly for birthdays and party table arrangements. What she puts together is always beautiful and unique – I wouldn’t use anybody else! Kathy is a local lady, very friendly and easy-going. Nothing is ever a hassle for her and she creates the most beautiful bunches at a great price. I know I can rely on her a couple of times a week for customer gifts and work displays. Kathy creates beautiful welcome packs for residents tailored to individual taste, including the most amazing chocolate and gift hampers for men! She is very patient and always listens to what I want. I was so happy with the service, I asked Kathy to be the florist for my daughter’s wedding and she did an exceptional job!